We are consultants who uphold a sense of humanity and commitment. We focus on your employees, your customers and your business, always striving to strike a good balance between listening and understanding, and between inspiring and teaching. We want to be close to you, sincere and committed so that we can create a high quality, long-term partnership. We teach, coach and train managers and employees in improving their communication and making desirable changes. This could be about methods of working, behaviour, communication. We help you to develop using the methods that we ourselves strive to live by. Every development, whether large or small, always begins with each individual employee, and each individual is unique in terms of what drives him or her. Therefore we have no ready-made packages; rather, we adapt all our training efforts to suit your organisation, needs and objectives. If, like most of our customers, you are interested in development, you will probably by now already have made a number of investments in training and development. That’s great! We will meet you exactly where you are today, with the needs that you have and on the basis of the level you are at right now. 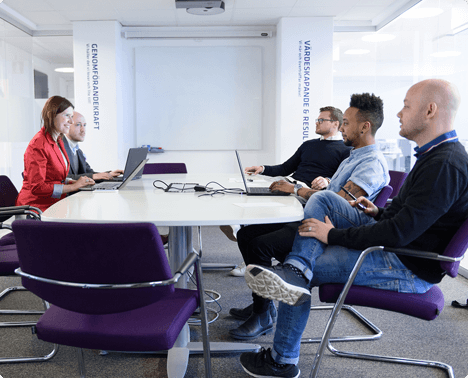 As a company, it is our belief that the best results are achieved through close collaboration, with the focus on you, your objectives and your employees from start to finish.